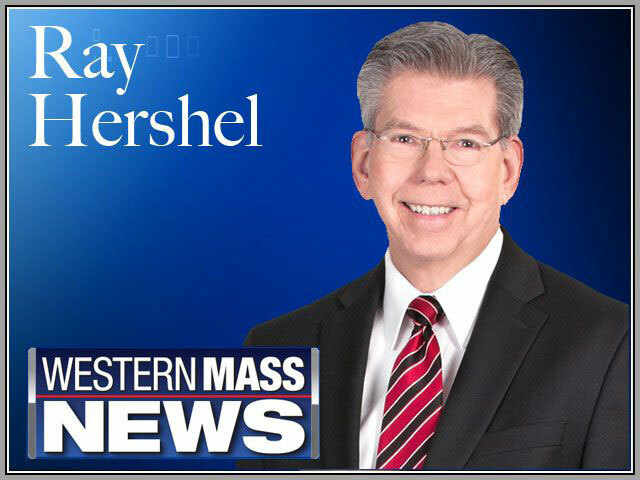 Ray Hershel is the dean of Western Massachusetts television journalists. He’s been a broadcast journalist in Springfield for 50 years and retired this year as a TV reporter and anchor for WGGB-TV. After graduating from Emerson College, Ray began his career April 15, 1968 at WHYN radio in Springfield as a news reporter and writer. Shortly after, he shifted gears and concentrated on television news, joining the Western Mass News Team. Over the years Ray has amassed numerous AP and UPI awards for excellence in television reporting. In his first year as a television reporter in 1973, Ray won UPI’s Tom Phillips first place award for his poignant report on the return of POW’s from Vietnam to Westover Air Force Base. Ray’s reporting has taken him to all parts of the world. In 1983 he went to the Middle East with an interfaith group from Western Massachusetts and produced an award-winning 10-part news series and documentary entitled “The Holy Land an Interfaith Perspective.” His 1984 documentary “Going for the Gold” won both local and national recognition. The documentary highlighted the achievements of the U.S. Men’s Gymnastics Team in the summer games in Los Angeles and featured hometown hero Tim Daggett of West Springfield. Ray has also given back to the community. He is on the Board of United Cerebral Palsy of Western Massachusetts, and his 1984 reports on the International Games for the Disabled won him awards for excellence in television reporting. He also co-hosted the United Cerebral Palsy Telethon for 15 years. Ray serves on the Board of Directors of Jericho, an organization that helps people with disabilities. Ray has also reported on the humanitarian missions of Westover Air Reserve Base by traveling to flood ravaged Honduras as well as Ramstein Air Force Base in Germany to document the work by local reservists in treating injured military personnel from the war in Iraq. Ray was also aboard a C-5 Cargo plane when it airlifted refugees from New Orleans after Hurricane Katrina. He also reported live from Rome during Beatification ceremonies for Pope John Paul. In 1993, Ray was inducted as a charter member into the New England Emmy’s Silver Circle. This prestigious award is given to members of the television industry who have worked in the business for at least 25 years. In 2006, Mr. Hershel won the Lifetime Achievement Award from Emerson College and the Radio-Television News Directors’ Association, and in October 2017, he was awarded with a Lifetime Achievement award from the Valley Press Club. Ray is a native of Western Massachusetts. He is a graduate of Chicopee High School and Emerson College in Boston. Ray and his wife Maureen who is a registered nurse live in West Springfield. They have three children and six grandchildren.